When looking at modular wall systems, there are a variety of materials that can make up the panel, depending on the customer’s needs. Ranging in colors, sound rating, and insulation level, Panel Built will be able to craft a panel that fits in practically any environment. However, there are two main materials that our modular structures will typically be either gypsum or steel panels. Both of these panels provide a variety of benefits to the structure, however, each is most effective in a particular environment. In this post, we will talk about the benefits of both systems and see what would work best for you. As far as panels go, our Gypsum/Gypsum panel is mostly the standard. Typically, for an inplant office, the panel that’s used is 3” thick with vinyl cover gypsum boards on both sides with a polystyrene core. So, why is this the most common? Let’s judge this by looking at three of the most important factors in a wall panel: insulation, sound transmission, and of course, price. 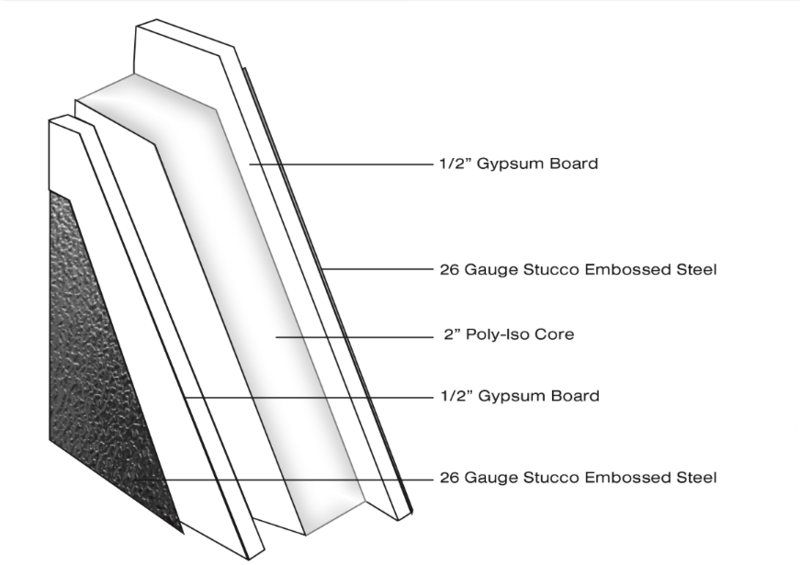 The gypsum panel with a polystyrene core provides a standard R-Value of 11. For most applications, an R-Value of 11 will provide proper insulation for a warehouse/inplant office system. However, the R-Value of the panel can easily be increased by simply increasing the overall thickness of the panel above our 3” standard. Additionally, Panel Built can adjust the materials inside the panel to increase its insulation properties. For STC, our standard Gyp/Gyp panel will have a 30 STC rating. However, of all panel properties, STC is perhaps the easiest to increase. Panel Built uses a specialized Sound Dampening board in instances where the panel’s sound transmission rating needs to be higher than usual. For instance, if the new inplant office needs to be in a placed in a particularly noisy manufacturing facility, we can provide a gypsum wall system that has an STC rating from 40-42! With a typical warehouse environment having a decibel level around 70 and manufacturing environments ranging from 80-100, additional soundproofing can be recommended, if not required to meet certain OSHA standards and codes. However, the biggest benefit of going with gypsum wall panels. Our gypsum panels are generally considered the most cost-effective of our modular solutions. The reason it is considered one of our “standard” panels is that it will fit into a variety of applications and works effectively at a relatively low cost. Additionally, the vinyl covering that is placed on the gypsum board provides the panel with a durable exterior that is easy to clean, making maintenance easy for the end customer. However, our steel panels come with their own benefits as well. 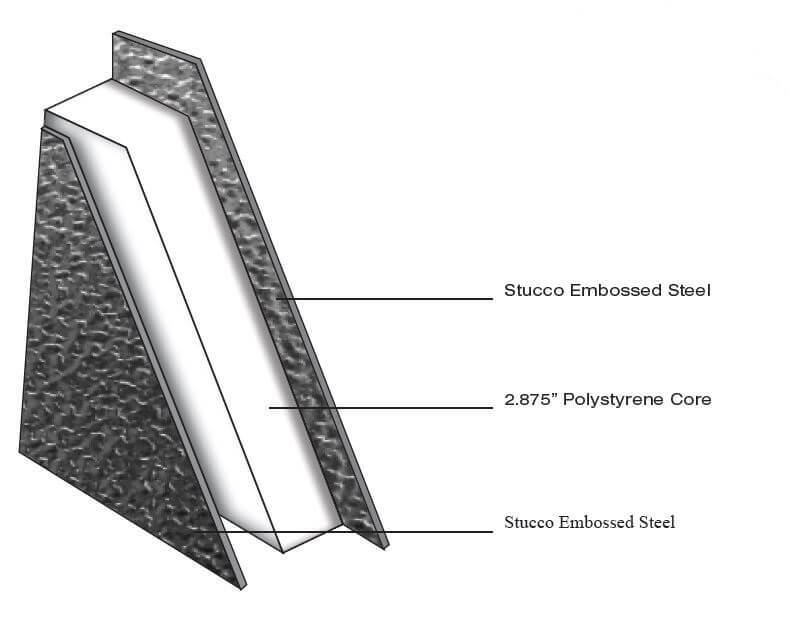 The best part about Panel Built’s steel panels is that they can still utilize some of the benefits that the Gypsum panels provide. For instance, our Steel/Steel panels consist of two 26-gauge, galvanized stucco-embossed steel sheets and a 2.875” polystyrene core. 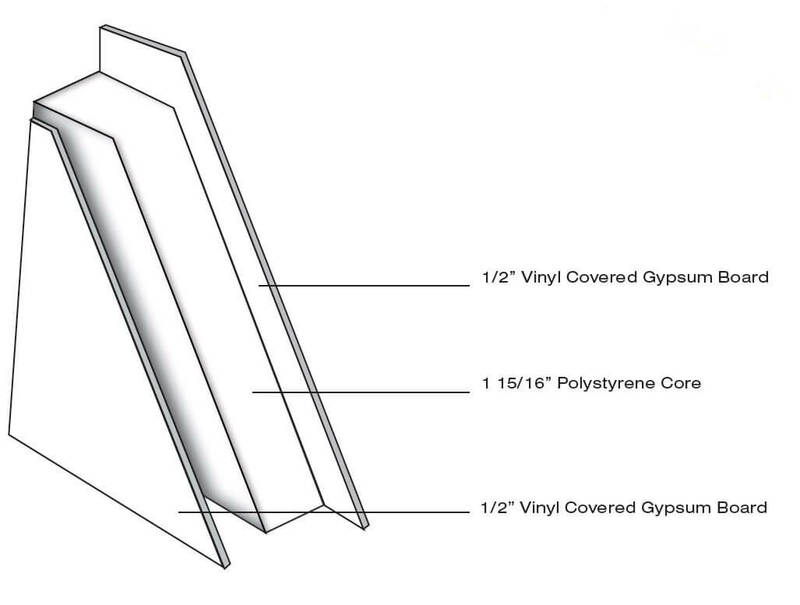 This panel will provide the end customer with the same exact R-Value as our Gypsum option: minimum of 11. However, with the Steel/Steel panels, the STC rating is going to be slightly lower than our Gypsum, coming in with an STC rating of 26. This lower rating is understandable as the steel layer is much thinner than our gypsumand allows vibrations through it much easier. However, the main benefit of the steel line of panels is its ability to stand up to tough conditions. Sometimes having steel paneling over the gypsum board will provide a better fit for your facility. That is because these panel systems provide an extra layer of protection for your modular office, allowing for incredible durability. This specific type of wall panel can come in handy in a warehouse or facility that sees a lot of foot traffic or forklifts moving back and forth. By being able to absorb more damage than your typical modular office, these specialized panels can actually save you money later on in potential repair costs. Overall, the choice between going for steel panels or gypsum panels will rely heavily on the application of the office/structure. In the majority of inplant scenarios, a standard gypsum wall panel will be more than serviceable for your facility. It is our go-to material for making a dependable interior modular building and solves most space needs at a low price. But if the building is in a particularly chaotic or harsh environment, or being utilized as an exterior building, the steel-gypsum/gypsum-steel panel provides all the advantages of our standard panel with an extra layer for durability. If you or your company is deciding which wall panel to use for your modular project, just give us a call at 800.636.3873 or send us an email at info@panelbuilt.com. As the modular building experts, we have the product expertise and know how to provide you with the structure that will best fit your needs (and budget). If you have any additional questions about our wall panels, feel free to talk to us on our LiveChat in the bottom right!